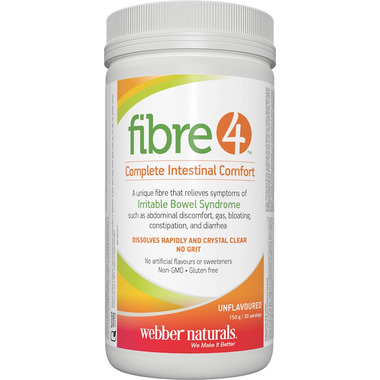 Fibre 4 is a unique soluble dietary fibre supplement that is clinically proven to improve bowel regularity, and relieve constipation and minor gastrointestinal discomfort in people with irritable bowel syndrome (IBS). The unflavoured powder dissolves fast and clear in your favourite beverages and complements cooked foods for convenient support of healthy gastrointestinal function. Recommended Dosage: IBS (adults): 1 scoop (7.5 g), 1-2 times daily, dissolved in water, or as directed by a physician. Constipation (adults): 1-2 scoops (7.5 – 15g) daily, dissolved in water, or as directed by a physician. IBS (children above 8 years of age): 1 scoop (7.5 g) daily, dissolved in water, or as directed by a physician. Constipation (children aged 12 to 16 years): 1 scoop (7.5 g) daily dissolved in water, or as directed by a physician. Caution: Consult a physician prior to use if: 1) you have diabetes mellitus in which blood sugar is difficult to regulate, 2) you are taking medications which inhibit peristaltic movement (e.g., opioids, loperamide), 3) you have symptoms such as abdominal pain, nausea, vomiting or fever (as these could be signs of abdominal constipation, disease of the oesophagus or the superior opening of the stomach (cardia), paralysis of the intestine, megacolon, faecal impaction, inflamed bowel or appendicitis). Consult a physician if symptoms persist or worsen, or if laxative effect does not occur within seven days. Do not use if you are experiencing a sudden change in bowel habits that has persisted for more than 2 weeks, undiagnosed rectal bleeding, or failure to defecate following the use of another laxative product. Keep out of reach of children.